Is teaching guitar to others something you’re interested in, or currently do? Its often said that the best way to complete the learning process is to pass on what you learn by teaching. Give some of these articles by Tom Hess a read if you think teaching others on guitar might be for you, or you’re looking to further improve the way you teach others to play. 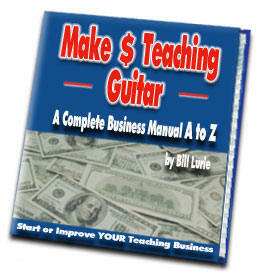 Alternatively, you might be interested in this step by step manual written by a guy called Bill Lurie. It’s an ebook that has proved quite popular with Shredaholic visitors, so far everyone we know who bought the book has been pretty happy with it. From teaching part time to friends or opening your own school, Bill seems to have all the bases pretty well covered and it’s worth taking a look – who knows where it might take you!